So I got this error whenever I open Everspace. I'm on STEAM and I've been getting it on full release and when it was on early access. Huh? This is very strange? Never heard or saw that before. I'll get back to you on this when I'm back at the office on monday. Hey ROCKFISH_Andi: FYI, I have STEAM defaulted to install games into my "K:\" drive instead of the default "C:\". please also list all drives, which currently do not show up as a drive letter, like SD-Card readers, which currently do not have a card inserted. After that please try to unplug all USB Sticks, all external hard drives (except you have installed Everspace on such a disk) and remove all SD cards from SD card readers [EDIT: and all CDs/DVDs/BluRays form your optical drives] and tell us if the problem still persists. After that please try to unplug all USB Sticks, all external hard drives (except you have installed Everspace on such a disk) and remove all SD cards from SD card readers and tell us if the problem still persists. Just saw this. I'll do this when I get home from work tonight. Sorry for such a late reply. I just moved to my new house. Anyway, the error is gone. Whatever you guys patched in this latest version fixed it. Getting the same error, game was working fine and then started getting this error after about 5 hours gameplay? could you please work through the list above? No card readers or usb sticks in use, just computer kb and mouse. Games are saved to SSd c: drive. Is Everspace installed to the default path (within the steam directory) or have you set a custom path? What happens, when you press "continue"? Is there (any) disk in drive E: ? If so: could you try what happens, if you remove it? If not: Could you try what happens, if you put a data disk into the drive? EDIT: is "D:" an internal or external hard drive? - I just click "install game" from Steam to default location, I have verified Everspace location to be within /steamapps/common along with all other games and Steam. - When "continue" is clicked, the Game launches. 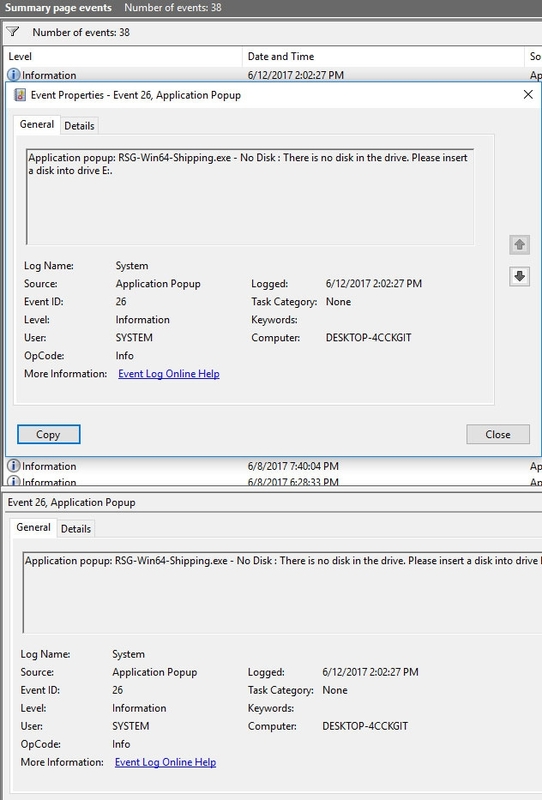 - No disk in drive, upon putting disk in drive, and loading game it still gives the same error. Game does launch and is playable I just hoped to help you guys allocate the problem, if I am having it and others. big thank you for your help! Run as admin same error. Since when are you playing Everspace? Have you played it before the full release update? Do you use more than one windows user? no changes to any drives. Game did not produce the error when I first downloaded and pklaying it, it seems to started around 3-5 hours of gameplay? Just made sure phone, camera and even controller disconnected and restarted Everspace, still error. Just updated Steam and rebooted, same error. Could you temporarily rename your save game folder? Windows Key + R => enter %localappdata% =>Open "RSG" => Rename "Saved" into "SavedBackup"
Windows Key + R => enter %localappdata% =>Open "RSG"
Also thanks so much Sven, for helping. I can only imagine how stressful it can be to diagnose these errors remotely. I love the game and appreciate being helped so promptly. If I copy the "Saved" folder to another location as a backup and uninstall and reinstall, think that would work? Well – give it a try! But I don’t have very high hopes in that. Could you start the game so you have a “fresh” error, look at your system time, memorize the exact time and then start the Windows Event Viewer (Windows key + R and enter eventvwr). I have to admit, I’m not very familiar with that tool, so I can’t tell you where to look exactly. Please see if you can find any recent entries for “Everspace” or “RSG” in some category (maybe “Windows-Protocols > Applications”) or other entries which match the time the error was shown, which tell something about a file/path that was not found. Message There is no disk in the drive. 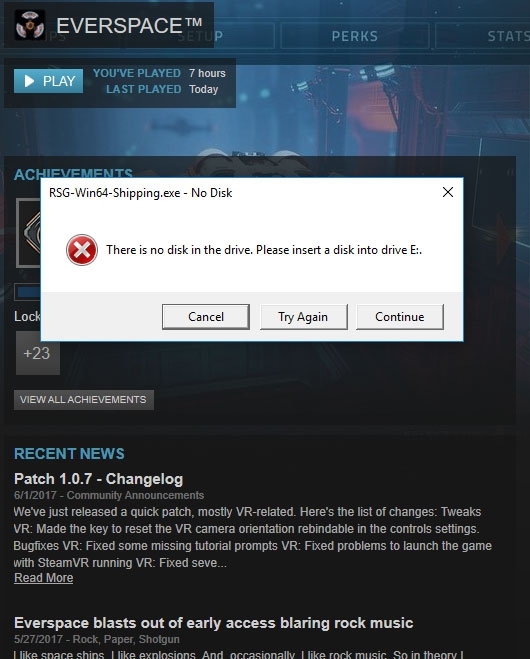 Please insert a disk into drive E:. Hello. I have the same problem as OP except just started last Saturday after Steam update. Running the GOG version of Everspace v.1.08.32661 and I notice I get this every time I launch the game after watching a movie. Just did a few quick tests, and these steps seem to reproduce the problem 100% of the time... Put a DVD movie in the optical drive and leave it long enough for the title to show up beside the drive-letter in Windows Explorer, then eject it again. Now launch Everspace, and the error should appear. Thanks for this info. Very strange, but we might be able to reproduce it now.